Remember when we all had clock radios beside our beds? The iPhone has all but replaced the need for these nearly quaint devices. 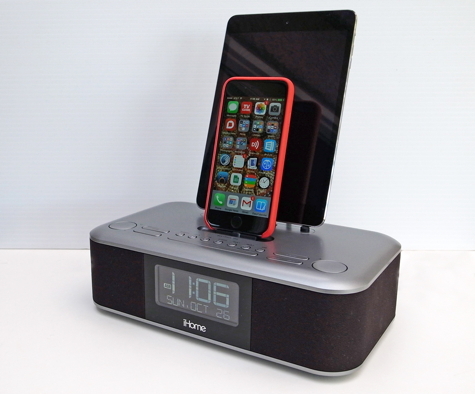 iHome has just introduced a product that updates the old standby: a bedside radio that charges your iPhone and/or your iPad while you sleep. The iDL100 has two brackets on the top equipped with Lightning connectors: one is for your iPhone (5 series and the new 6 and 6 Plus), and the other is for your iPad (4th generation and later.) You can choose to have the unit wake you with a musical tone, the radio, or a playlist from your iPhone/iPad. There is also a 3.5mm Aux-in port on the back for use with other audio sources. The iDL100 incorporates some unexpected but handy features. There is a standard USB charging port on the back. If you have an older 30-pin Apple device, you can plug it in here. The built-in charger will handle other devices such as one with a micro-USB plug. Another convenience: when you plug in your iPhone, the clock on the radio auto-syncs with the always-accurate time shown on your phone. All the usual clock radio features are available on the iDL100: programmable snooze times, gradual volume increase for waking and decrease for sleeping, dual alarm schedules for weekdays and weekends, and six radio station presets. The radio operates on voltages from 100 to 240 volts AC. The sound quality is very good. There are individual equalizer adjustments for bass, treble, and left/right balance. The two speaker chambers are sealed, producing iHome’s proprietary Reson8 sound. The equalizer has a 3-D setting that introduces an almost imperceptible reverberation making the sound stage seem larger. This 3-D effect can be turned off or on depending on your personal taste. I’m happier with this feature turned off. The top of the unit has 14 buttons. Some are rocker switches and some press. They are used to control all of the features and functions described above. The volume button and the station selection button are large and slightly concave, but none of the other buttons can accurately be chosen by touch. You need to see what you are pressing. This can be a problem if you are in a darkened room or are groggy from sleep. Whatever happened to the lowly knob? A simple turn to lower the volume was so convenient. Now you have to locate and press the Volume Down button. One of the problems with most docks is that the case on your iPhone or iPad must be removed while your device is docked due to the added thickness. The same applies here with a notable exception: I have the new iPhone 6 with Apple’s slim leather case. It fits and stands in the dock perfectly. iHome has developed a couple of iOS apps that are made for their products: iHome+Sleep and iHome Set. Because I can set up everything I need directly on the iDL 100 or the iPhone without using these apps, adding another one to my phone seems superfluous, but that’s a personal preference. 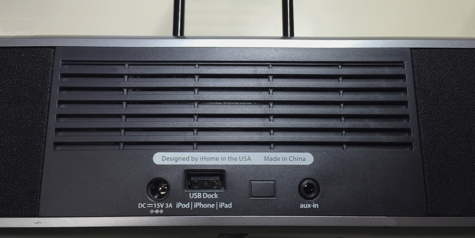 The iHome iDL100 is loaded with features and sounds terrific. The fact that it charges your iDevices and can play music stored on them, makes it a winner. MyMac Review rating is 9 out of 10.